This post is a slight aside based on minor details in the paper "Insulin resistance is a cellular antioxidant defense mechanism". Which shows, quite clearly, that palmitate at levels as low as 0.05mmol/l causes some degree of insulin resistance. By 0.15mmol/l it's significant and by 0.5mmol/l it's worse. The graphs are from myocytes in cell culture. This graph show GLUT4 count on the surface of myocytes. Left is control, next is the count after an acute exposure to insulin, taken as the 100% response. Adding more and more palmitate decreases the percentage response. No one, not even a fatphobic vegan, has palmiatate levels in the FFAs of their blood as low as 0.05mmol/l. 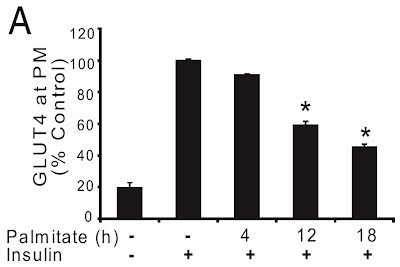 This graph shows the effect of exposure time to 0.15mmol/l on GLUT4 translocation. Things get worse by the hour. Is this real? "Palmitate (PALM) treatment was performed essentially as described in ref. 5"
5. Hoehn KL, et al. (2008) IRS1-independent defects define major nodes of insulin resistance. Cell Metab 7:421–433. "In our preliminary investigations, we observed that high (>300 μM) palmitate doses were toxic to cells, resulting in morphological changes and even detachment from the substratum." Palmitate is clearly pretty nasty stuff. And I feed it to my daughter! "...while total glucose levels (measured with an Accu-Chek II glucometer [Roche]) decreased slightly from 24.7 ± 1.6 mM to 23.3 ± 1.9 mM". The DMEM cell culture medium used here contains 25mmol/l of glucose! "Palmitate at 0.3mmol/l is severely toxic to cultured cells in the presence of 23mmol/l of glucose". That I can certainly believe. Aside: It is very interesting to note that palmiate at 0.15mmol/l is low-physiological for a human and yet is described as toxic, without mention of the grossly pathologic 25mmol/l of glucose in the culture medium. I suspect that whenever you look at a cell culture based study demonstrating palmitate toxicity this will apply. So, does palmitic acid cause insulin resistance (aka superoxide production) under low glucose conditions? Where there is no caloric overload? Here is today's obligatory reading. What is it all about? 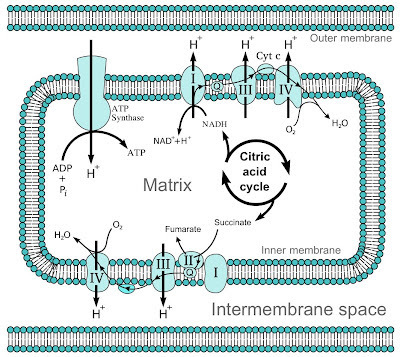 They are trying to tease out what is happening directly within the mitochondria when different metabolic substrates are offered to the citric acid cycle. This is not easy. Their mitochondrial model is far from reality but is the best we can do at the moment, certainly in 2008. The authors are well aware of this and discuss the issue in some detail. I feel, personally, that what they have found makes perfect sense and can be extended, as is my tendency, to make a few more links in to basic physiology and, eventually, insulin resistance. It's also worth pointing out that they are dealing with isolated mitochondria. No cells, no insulin, no adipocytes, not even any cytoplasm to support glycolysis. You can't run mitochondria on glucose! A model. "While it is generally accepted that mitochondria are the main site of cellular ROS production, studies in isolated mitochondria have shown that the amount of H2O2 released by mitochondria (H2O2 originates from the dismutation of O2•− , and is much easier to measure than O2•−) undermost conditions is rather modest (<0.1%electron leak). The exception to this is succinate driven reverse-electron transfer through complex I, a condition yielding by far the highest rates of H2O2 release in isolated mitochondria [7–10]. This holds true in mitochondria isolated from diverse tissues (up to 2000 pmol of H2O2/min per mg of mitochondrial protein [7–15]). Indeed, the frequently quoted value of 1–5% of electrons passing through the chain being diverted to the formation of superoxide is only true under this condition [16,17], and the notion that mitochondria are the strongest source of cellular ROS largely derives from these measurements." And what is "needed" for this spewing of electrons on to molecular oxygen? "In isolated mitochondria, reverse-electron transfer through complex I occurs when the ubiquinol pool is in a highly reduced state and a strong membrane potential is present, i.e. the energy of the membrane potential drives the ubiquinol (with electrons provided by succinate)-dependent reduction of NAD+ to NADH with electrons passing in the reverse direction through complex I ." We talked about the CoQ couple in the last post. Here it is being referred to as ubiquinol, the reduced form of CoQ. A reduced CoQ couple is essential for reverse electron transport. Also note the necessity of "a strong membrane potential". They isolated mitochondria and studied them asap, in the short time-window during which they remain remotely functional. They fed them with various components of the citric acid cycle and looked at H2O2 production, a reasonable surrogate for superoxide. Adding in glutamate mixed with malate is a classic combination for driving NADH utilisation through complex I. The mitochondria generate about 30pmol/min of H2O2 under these conditions. This is not a lot and some labs report the amount as being close to zero. Driving complex II (succinate dehyrdogenase) directly, using succinate but not supplying any NADH generators, produces rather more H2O2, around 400pmol/min. A ten fold increase. Driving both complex I and complex II with a combination of all three of the above substrates can produce over 2000pmol/min H2O2. Sometimes but not always, as we shall see. All of these findings where achieved at physiologically plausible concentrations of substrate. However oxaloacetate, formed in-situ from the malate supplied, turned out to be a confounder for that last result. Oxaloacetate is an inhibitor of complex II, so reduces reverse electron transport through complex I. With succinate dehydrogenase partially blocked the CoQ pool is less reduced, so more ready to accept electrons from Complex I, rather than driving them the wrong way through it to generate superoxide. The end conclusion the paper came to is that anything which depletes oxaloacetate will disinhibit succinate dehydrogenase, reduce the CoQ pool and at the same time increase the likelihood of reverse electron transport through complex I, leading to superoxide generation. The follow on from this is that anything supplying large amounts of acetyl-CoA will automatically deplete oxaloacetate because citrate synthetase consumes oxaloacetate as it combines it with acetyl-CoA to start the citric acid cycle with, err, citric acid. The group did it with pyruvate. They did it with palmitoyl carnitine. Pyruvate = carbohydrate. Palmitate = fat. In the real world the cycle turns and the acetyl-CoA source which initially depleted oxaloacetate eventually restocks the oxaloacetate supply (except in the ketogenic liver of course). But the initial oxaloacetate depletion sends a signal. The mechanism is the activation of succinate dehydrogenase, which both allows the citric acid cycle to cycle and promotes a significant reduction of the CoQ couple which can generate superoxide. I would just like to point out that beta oxidation, through electron-transferring flavoprotein dehydrogenase (previously described in Peter terms as complex II-like), reduces the CoQ pool independent of succinate dehydrogenase (genuine complex II). Would you expect a reduced CoQ pool from beta oxidation to predispose to superoxide generation? Might this be a Good Thing or a Bad Thing? Think carefully about the semantics here. What do we mean by "good" and "bad"? Superoxide is important. It speaks to tissues far away from the mitochondria which generated it in addition to the cell containing them. We need to translate this in to more familiar terms, which has been hard work avoiding slipping in to in this post! The next post is about insulin resistance. You would be dead without it. Butter, rich source of palmitic acid. Uh oh, I think superoxide may be replacing palmitic acid as my favourite molecule. One good thing leads to another. Must get on with the next two posts! BTW the mess on her face is, as always, 90% cocoa chocolate. Here we have a nice schematic of the electron transport chain in a diagram of a mitochondrion taken from Wiki images. The ATP Synthase complex shown on the upper left of the mitochondrial diagram allows protons from outside the inner mitochondrial membrane to pass back in to the mitochondrial matrix, generating ATP in the process. Under White Non Smoker conditions this electro chemical gradient might well have been maintained for free by the geochemistry of serpentinisation plus an acidic ocean. Nowadays the combined pH and electrical gradient which drives this ATP factory is maintained by the electron transport chain. This transports positively charged protons out of the mitochondrial matrix to maintain the gradient which is dissipated during ATP production. 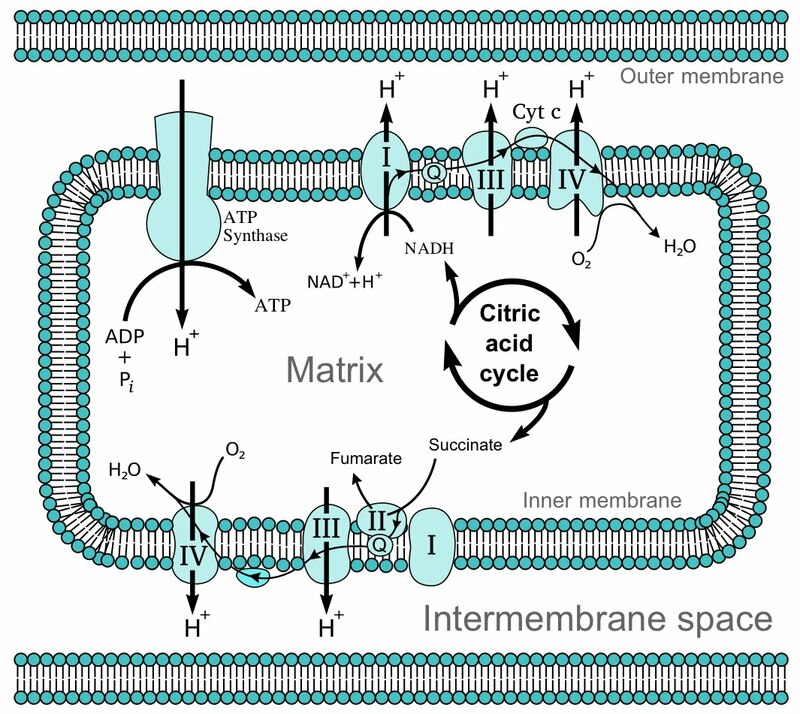 In the diagram you can see two versions of the ETC being driven off of the citric acid cycle. On the upper right hand side a molecule of NADH provides electrons to Complex I. Complex I pumps some protons, hands the electrons to the Coenzyme Q pool (CoQ, marked as Q on the diagram) of electron transporters which then hand them on to Complex III. Complex II is not involved. The CoQ pool is a mobile reservoir of redox shuttles (electron transporters) which hands electrons to Complex III. The second version, shown on the lower area, has succinate feeding in to Complex II. Complex II is actually the succinate dehydrogenase enzyme of the citric acid cycle. It is built in to the wall of the inner mitochondrial membrane and hands its electrons to the CoQ pool directly, no Complex I involved. Another difference is that Complex II doesn't pump any protons. The proton pumping done by electrons passing through Complexes III and IV is independent of their route of entry to the ETC. Anything feeding in to the CoQ pool feeds onwards through Complexes III and IV. Mostly. 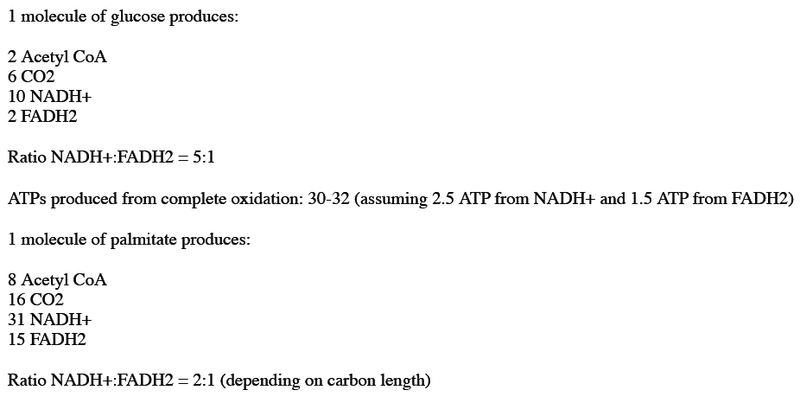 So we have the citric acid cycle processing acetyl-CoA to a ton of NADH for Complex I and a smidge of FADH2 within Complex II. The FADH2 is quite tricky. It is embedded deeply within the succinate dehydrogenase enzyme and never, as far as I can make out, goes anywhere. It flicks between the FAD and FADH2 state as the citric acid cycle turns and basically acts as a bridge to transfer the effective oxidation of succinate to the reduction of the CoQ couple. Another route in to the ETC, which seems sorely neglected, is Electron-Transferring-Flavoprotein Dehydrogenase, which sadly has no handy name. ETFD sits in the inner mitochondrial membrane and passes electrons to the CoQ couple, much as Complex II does, also without puming protons. ETFD gets its electrons from the FADH2 of an electron transfer flavoprotein which, thankfully, gets its electrons from the FADH2 of acyl-CoA dehydrogenase, the first enzyme of beta oxidation. Back on home territory. So fatty acid beta oxidation feeds in to the ETC at a "Complex II-like" membrane enzyme. It uses FADH2 to do this. It generates a small amount of NADH as well. So we have two non-Complex I inputs in to the CoQ couple. Aside: There are three if we include glycerol-3-phosphate dehydrogenase. Four if we include glycerol-3-phosphate oxidase Probably more. But let's keep it simple and stop at two... Actually glycerol-3-phosphate oxidase is really interesting as it specifically generates H2O2 enzymically. H2O2 production is generally considered to be a Bad Thing. Now what might the deliberate generation of H2O2 be signalling? Very interesting! Maybe another day. So the citric acid cycle inputs just a few electrons through FADH2 at Complex II compared to the number it supplies using NADH at Complex I. Glycolysis is even more Complex I focused as it only adds NADH to its acetyl-CoA generation. 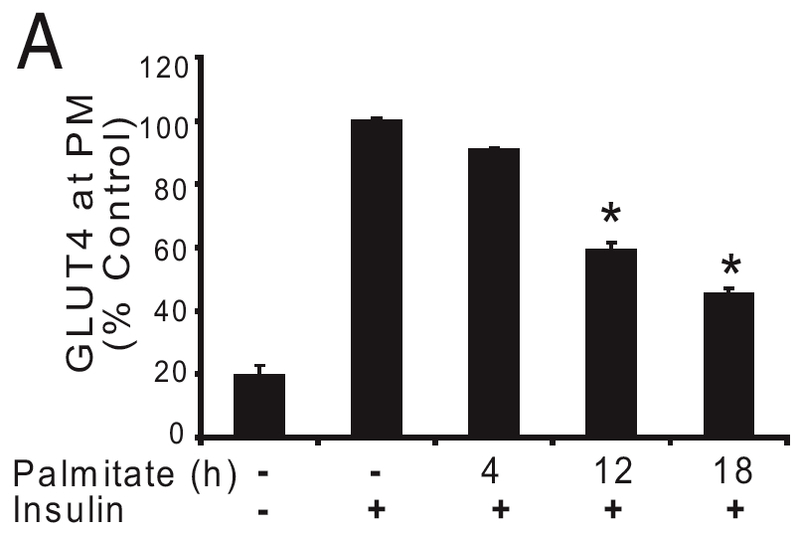 However beta oxidation markedly inputs through the FADH2 of ETFD, with relatively little input using the NADH from the beta oxidation process, again in addition to generating acetyl-CoA. 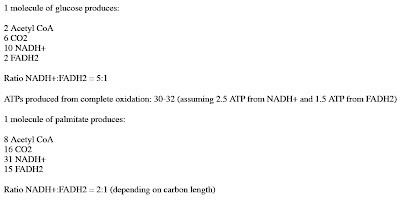 Obviously all acetyl-CoA generates the same ratio of NADH to FADH2. As you can see glucose produces 5 molecules of NADH for each FADH2 where as fat produces only 2 molecules of NADH for each FADH2. Glucose drives complex I significantly harder than fat does. Fat drives with a "Complex II-like" bias, supplying FADH2 from ETFD much as succinate dehydrogenase supplies some FADH2 from acetyl-CoA. Both FADH2 inputs do exactly the same thing to the CoQ couple, they reduce it. A reduced CoQ pool has major implications for electron transport and free radical generation. I rather like eating fat. What does that do to Complex I? It's probably not the obvious answer. Labels: Protons (02): Where's the bias? The Lizard Peninsula in Cornwall is an interesting place. For a variety of geological reasons a chunk of deep ocean mantle is available to visit on the Earth's surface, without getting too wet or borrowing a deep ocean submersible. We visited Kynance Cove about 10 years ago to pick up a few pebbles of serpentine. We were LC beginners at the time. Serpentine is formed during the hydration of olivine by sea water, as it percolates in to the earth's crust. The process generates heat, produces molecular hydrogen and increases the volume of the rock by about one third, massively fragmenting it. Sorry for the lack of a hammer. Large amounts of warm, hydrogen rich fluid are produced under pressure and enter the ocean at hydrothermal vents. The chemistry of serpentinisation also means that the fluid is alkaline. The process is continuous and occurs over geological time scales. These are alkaline hydrothermal vents. I prefer the term of White Non Smokers (rejected by Nick Lane). Unlike the well known Black Smokers of the mid oceanic ridges/troughs, White Non Smokers generate temperatures and mineral concentrations which are not particularly aversive to the abiotic chemistry which might be considered as pre biotic. The early Earth is thought to have had an atmosphere, like that of present day Mars, which was CO2 rich. This would have made the early oceans mildly acidic. White Non Smokers are also structurally full of microporous vents. These have vesicle structures which have warm alkaline fluid within and cool acidic fluid without. There is, intrinsically, a pH gradient across their wall. The difference in positively charged hydrogen ions across the vesicle wall is comparable to the proton gradient across microbial, and of course mitochondrial, surface membranes. This might be where life started. If it is, here is the proton gradient, nowadays maintained by the electron transport chain pumping protons, pre dating the development of that chain. Under WNS conditions it is possible to generate high energy molecules using the geochemical proton gradient intrinsic to the vent vesicles. For life as a more distinct entity to leave the WNS suburb simply requires a method to maintain the proton gradient away from the geochemical reactor which initially sustained it. ATP or, in all probability, a simpler high energy molecule could be made for free in the WNS environment. Away from any "free" proton gradient you need to do work to sustain one. Acetate (like methane) is one of the few products of the exergonic combination of molecular hydrogen (from the vent) with CO2 (from the ocean) which supplies enough energy to maintain a proton gradient in an ATP producing state, without any other energy input, no geochemistry, photons or complex organic chemicals. There are modern, highly evolved and sophisticated bacteria thriving on this utterly primordial pathway even today. Acetate, to them, is waste. But it can be used if you are so inclined. As you might expect, activated-acetate (nowadays in the form of acetyl-CoA) forms the basis of most modern metabolism, generating ATP in large amounts through the electron transport chain. But it's probably less primordial than the proton gradient itself. Which has some bearing on health. Labels: Protons (01): Where's the pump? Measuring thyroid hormone level is a very simple matter in clinical practice. For total T4 you can do it in-house if you don't care too much about accuracy. A commercial lab is better. Very occasionally you meet a patient with very clear cut markers of thyrotoxicosis which has a T4, as measured by a commercial lab, which is persistently within the upper end of the lab reference range for normality. For these (usually cats) we check the free T4 level. Free T4 is not cheap, despite the name, and takes some time to come through from a referral lab. We use this test because almost all of the total T4 in plasma is bound to albumin and assorted other plasma proteins. We need the "unbound" or active concentration thyroxine because this is what does what it does. Of course no one really wants to measure free T4 anyway, what we want is the actual active hormone, T3. Preferably free T3. However, for many cases, free T4 is good enough. Measuring T3 or (gasp) even free T3 is another ball game and is something I only request occasionally. Usually when trying to get to the bottom of apparently hypothyroid dogs when all lab results come back "borderline low". Unfortunately free T3 is not available in the UK and sample gets couriered to the USA. I think the courier must swim the Atlantic judging by the time taken. But ultimately even the free T3 is only a surrogate for the level of T3 which is actually bound to its receptor within the nucleus of each cell, including those of the brain. Measuring receptor occupancy this is neither easy, clinically appropriate nor commercially available. But fortunately there is a surrogate. You can get an idea of whether the brain thinks there is enough T3 sitting on its receptors by whether it is asking for more. It asks for more using (eventually, after several steps) TSH, thyroid stimulating hormone. This is released from the pituitary as a signal to the thyroid to increase production. So the rule of thumb with a suspected hypothyroid patient is to ask whether the TSH level is elevated, ie is the brain unhappy with the current thyroid level. When you don't have the time or finances available for that courier to swim the Atlantic, this is what we use. It's a surrogate, but useful. As so often, this is just basic clinical chemistry. It defines how I view hypothyroidism. So let's put some folks on a diet, get them down to 10-15% below their start weight and look at their thyroid status. Keep them as weight stable as you can and look at total T3 levels on three different diets. Not surprisingly the level of thyroid hormone falls with weight loss. The run-in diet provides weight stability before weight loss and the T3 is 137ng/dl. The same folks after weight loss, and on 310g/d of carbs, have a T3 of 121ng/dl. On 205g/d of carbs the T3 is about the same at 123ng/dl. But with carbs restricted to 50g/d of it drops a whopping 29ng/dl to 108ng/dl, twice the drop of the more moderate carb diet phases. There you have it. Eat LC and thyroid deficiency, here you come. OK, so the next question is: What does the brain think about all of this? Remember T3 is not free T3 and certainly not nuclear bound T3, so we have to look at the surrogate. What is the message from the brain to the thyroid gland concerning the adequacy (or not) of current thyroid levels? Which way does the TSH, our crude surrogate for effective neuronal nuclear bound T3, shift? The run-in TSH is 1.15microIU/ml, this is on obese weight stability. It goes up (the Badness direction) to 1.27microIU/ml on high carb, 1.22microIU/ml on moderate carb and it drops (the Happy direction) a gnat's whisker to 1.11microIU/ml on LC. Summary: Despite the limited fall in T3 on higher carb diets, the brain is not happy with thyroid status. TSH goes up. Gimme gimme gimme, more more more. However, even with the greater fall in total T3 under LC eating, the brain is happy with whatever level of free T3 it is "seeing", as judged by TSH level. Should the brain be happy? There are hints. In particular the TEE was reduced least in the LC phase of the study. There was a reduction in TEE of course. But less than for either of the other two phases imposing weight stability at reduced BMI. Despite the largest drop in total T3. 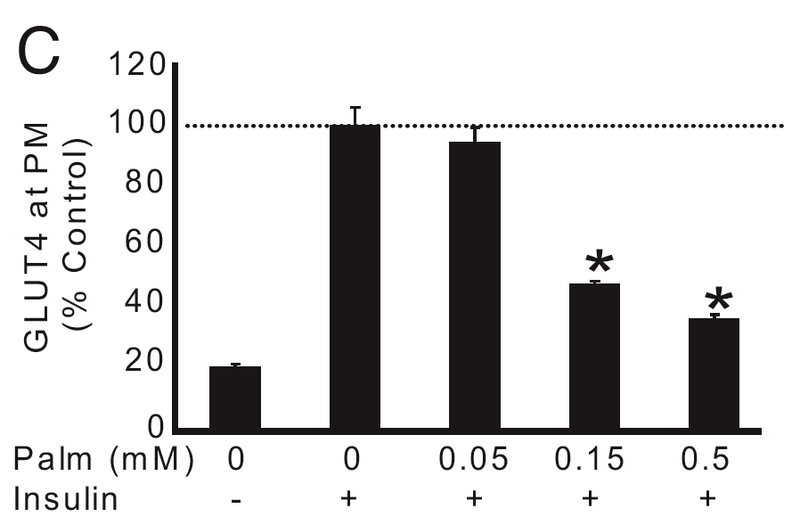 It seems like a reasonable idea that both free T3 and receptor bound T3 might actually be higher under LC eating. As so many times, we will never know. Another way of looking at the change would be to consider whether as much free T3 is needed on a LC diet. Sam Knox provided this rather nice link in the comments to The lost 300 post. It's certainly worth thinking about. Of course, I quite like the idea. But then I would! So will low carbohydrate eating lead to thyroid deficiency? Who knows, in the long term. This was a very short study. But in this paper the brain seems quite happy with 108ng/dl of total T3 as judged by a TSH of 1.11microIU/ml. This does not look like hypothyroidism to me. "As in previous studies, discrepancy between cortisol regeneration measured during dynamic testing and the more conventional index of 24-h urinary endogenous cortisol/cortisone metabolite ratios (Table 2) reflects the confounding effects of 5 alpha- and 5 beta-reductase activities on ratios of steroids excreted in urine." Translation: Relying on 24h urinary cortisol may mislead you. That might help with LC bashing, but you're still misled. "Low-carbohydrate intake appears to be the key factor responsible for alterations in glucocorticoid metabolism"
Translation: LC eating is what is KEY to IMPROVING glucocorticoid metabolism. "...extraadrenal regeneration of cortisol is responsive to the macronutrient content of the diet. In these obese men, a low-carbohydrate diet reversed the increase in metabolic clearance of cortisol (3), increase in 5 alpha- and 5 beta-reductase (4), and decrease in hepatic 11 beta-HSD1 (5, 6) previously described in obesity. Translation: LC eating reverses the nasty effects of obesity. "The increase in 11 beta-HSD1 activity, and hence intrahepatic cortisol concentrations, caused by a ketogenic low carbohydrate diet has implications for the efficacy of different dietary strategies in reversing the metabolic consequences of obesity." Translation: LC eating wins hands down for correcting the metabolic consequences of obesity.